Hey, did you ever listen to Heartland, or do you still owe me a review? Hopefully neither of you have this already but I think it's something you'd both really like. 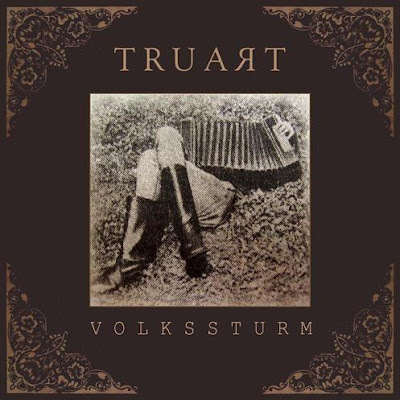 Truart is a one man Ukrainian band featuring heavy martial beats, odd samples, noise and... accordion. There's definitely a strong industrial/neo-folk influence on this album, which is why it made me think of you two. Anyway, I hope you like it. I have to think of something great to send you too. I'm glad! I honestly thought Heartland was better than the Suburbs last year. Great stuff. I'd be happy to get a rec from you. I could actually send you the Listener album. Don't know if you'd like it but I think it was pretty much the best album from last year. Listener is this guy called Dan Smith and he calls the music Talk music. It's basically a mix of indie with poem reading kind of vocals in it. Reminds me a little of MewithoutYou's Aaron Weiss.